Las Vegas isn't exactly a city that invites its visitors to act carefully and think deep thoughts; ultimately, the reason most people come to Vegas is to blow their hard-earned money on all manner of mindless entertainments, be they alcohol, slot machines, or strip clubs. Leave it to Penn & Teller, then, to carve out their own little niche in their eponymously-named showroom at the Rio by performing their signature brand of magic, which aims to encourage people to think a bit deeper while in Vegas while simultaneously giving the audience an old-fashioned magic spectacle. I think they succeed-for the most part. 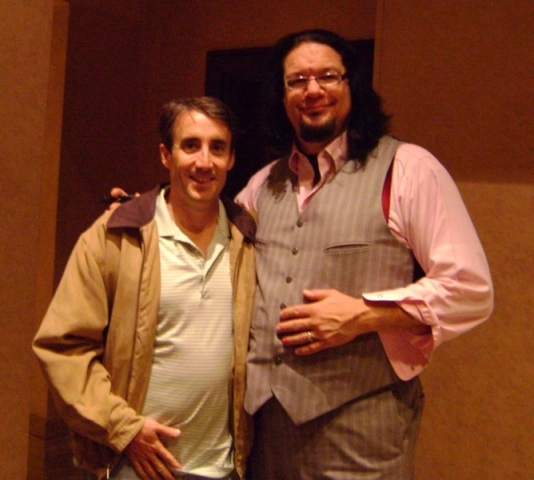 Even those who aren't big fans of magic shows are likely familiar with Penn & Teller, who have performed magic shows off and on in Vegas for decades but have also made names for themselves in many other areas, including their (well, OK, mostly Penn's) outspoken views on skepticism and atheism and their TV show devoted to debunking various scams and myths, known on video store shelves (and family-friendly websites such as this one) as Penn & Teller: B.S.! As one might imagine, their fame has not come without considerable controversy. But it shouldn't be surprising-perhaps, depending on one's perspective, it's a bit disappointing-that "Penn & Teller," the show, comes off as un-offensive and all-encompassing as it is. Sure, there is a bit early on in the show that mocks airport security, showing how absurdly easy it is to get knives and other weapons through a checkpoint, and a now-famous trick towards the end involving the Bill of Rights getting wrapped in an American flag and burned. But even these tricks feel toothless, drained of the venom the duo has used toward more controversial topics on their TV show. Penn & Teller are primarily entertainers, after all, and they ultimately do an excellent job walking a very tricky tightrope to address such topics in their show without alienating their audience. Political material aside, "Penn & Teller" is largely what one familiar with the duo would expect: part magic show, part deconstruction of a magic show, with some simple tricks explained in an entertaining way, and several tricks that begin simply but end up leaving the audience's collective heads spinning. Midway through the show comes a debunking of psychics and their methods, which is entertaining and informative, but not particularly groundbreaking. (Does anyone who goes to see a Penn & Teller show even take psychics seriously to begin with?) More successful is a trick involving toy cows and a video camera, which begins as a parody of "close-up" magic buts ends up as something else entirely. The show also firmly cements its PG-13 rating with a small bit of language and a particularly gruesome variation on an old magic show cliché (I won't spoil it too much, but it involves a showgirl and a giant saw). "Penn & Teller" is all-encompassing, but only for the adults in the room. Penn may seem to be the dominant force of the show, simply by virtue of his imposing stature and booming voice, but Teller's silent contributions should not be overlooked; his bemused facial expressions and Charlie Chaplin-esque comedy are often highlights. Not everything in "Penn & Teller" is a winner, though, particularly the grand finale involving two guns and a couple of magic bullets-it's ultimately impressive, but requires too much explanation both before and after to really make the impact the duo wants it to have. The audience for Penn & Teller-the magicians-is largely self-selecting. Those who are fans of them and what they stand for know what they are getting into, and will likely find "Penn & Teller"-the show-very entertaining. Those who are not as enthusiastic about the illusionists, however, will still be generally pleased with what transpires in their show: it's challenging in spots, sure, but Penn & Teller have clearly put a lot of effort into making their show and their message as accessible as possible. (Penn's views on organized religion-probably his most controversial aspect by far-are not mentioned at all during the evening, which is probably for the best.) So even those who aren't fans of Penn & Teller in general will likely find themselves entertained-perhaps even challenged. Which may be a good thing. After all, didn't we come to Vegas to live on the edge a little bit? Picture of the Wizard with Penn, taken after the show. The Wizard thinks Penn was mimicking him. Best way for cheap Penn & Teller tickets? Does anyone have penn and teller tickets for sale?